His lawyers plan to sue both the NRL and the player whose tackle left him paralysed. McKinnon pictured watching an NRL game in 2015. 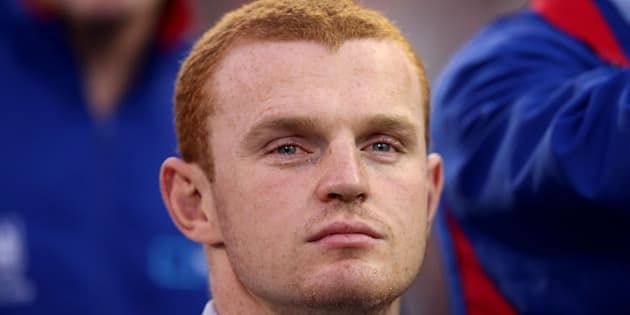 Former Newcastle Knights NRL player Alex McKinnon will sue both the NRL and Melbourne Storm player Jordan McLean for the incident that left him paralysed in 2014, News Corp reports. McKinnon, now 24, was left a quadriplegic when a McLean tackle just before halftime went horribly wrong and he suffered two fractured neck vertebrae. McKinnon's legal representatives reportedly sent a letter to the NRL last week commencing legal proceedings against both the national competition's governing body and McLean himself, 25, who is still a Storm player and indeed played in the losing team in the 2016 NRL grand final. It's believed to be the first time that a former player has taken legal action over an injury suffered in an NRL game. McKinnon has already received a $500,000 compensation payout from the NRL, and more than $1 million from fundraising efforts. However his medical expenses are believed to be extremely high, and McKinnon's legal representatives have reportedly met with NRL CEO Todd Greenberg, arguing more funds are needed. Senior Channel Nine sports reporter Neil Breen broke the news that McKinnon was paralysed back in 2014, with the family's consent. He told The Huffington Post Australia that some sort of legal action appeared to be inevitable. "I'm not surprised at all they've gone down this track because the family was always angry from day one," Breen said. "Alex was always going to face severe challenges in his life and the gravity of the situation is devastating for all concerned."